Rapid development of tourism in the modern world, the broad infrastructure of the tourism industry, creates great opportunities for people's leisure and, also, causes environmental problems. Thus, eliminating the harmful effects of tourism on ecology is one of the important tasks facing the modern tourism sector. From this point of view development and promotion of ecotourism is of great importance. State Tourism Agency of Azerbaijan is actively working for the development of ecotourism and agrotourism, the head of the State Agency, Kanan Gasimov, told Trend. He noted that, currently, a document is being developed to attract foreign investment in the tourism sector as a whole, as well as in such priority segments as agrotourism, ecotourism, mountain tourism and other types. “We are planning to comlete the development of this document by the end of this year,” said Gasimov. The head of Agency noted that major reforms were carried out in the sphere of tourism, on the basis of which a stimulating package was developed aimed at the development of the tourism industry in Azerbaijan. At the same time, he added that the reforms will continue in this direction in the following years. Earlier, the Ministry of Ecology and Natural Resources of Azerbaijan stated that Azerbaijan will develop its ecotourism concept soon. The work in this direction is being carried out in cooperation with foreign experts. For instance, foreign experts, who recently came to Azerbaijan at the invitation of the State Tourism Agency, familiarized themselves with national parks. In recent years, the creation of a diversified tourism infrastructure in Azerbaijan has increased the interest of foreign tourists in the country. There are many opportunities for tourism in our country, including rural, health, environmental, cultural, social, commercial, sport and etc. Ecotourism is a relatively new phenomenon in global tourism activities. Ecotourism is an environmental tourism oriented to nature preservation. The route of ecotourism, unlike the other types of tourism, is mainly based on nature objects - forests, forest massifs, reserves, sanctuaries and national parks. The distinctive feature of ecotourism is that it encourages people to come in contact with nature, prevents negative impacts on cultural and natural environment, and encourages tourists and tourists to help preserve the environment and accelerate socioeconomic development. In turn, agrotourism, which is also called "rural" or "green", is a type of tourism which provides for temporary stay of tourists in the countryside for recreation. Here, tourists can enjoy fascinating walks and hiking, bathing in ponds located near. Interest in ecotourism and agrotourism is growing in Azerbaijan. Azerbaijan has a potential for the development of these types of tourism. Azerbaijan is rich with natural resources, ancient history and magnificent landscapes. The country attracts tourists with its modern architecture, resort areas, national parks, museums, historical monuments. 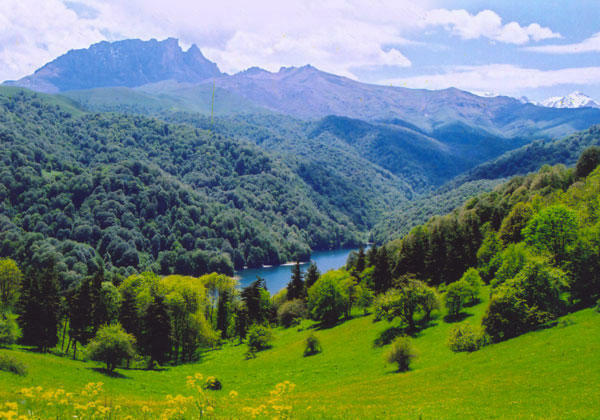 All the National Parks have a route for ecotourism and currently their number equals to 100 in Azerbaijan. National parks are protected by animals included in the Red Book and plant cover. The country's national parks often become travel destinations for tourists. As many as 79,997 people visited the national parks of Azerbaijan in 2018. Of this amount, 7,478 were foreign guests of the country. Azerbaijan is famous for its national parks, where you can go hiking if you prefer active holidays or have a simple pleasant picnic if you are there just to relax. Azerbaijan's national parks offer you to get exciting impressions, take care of your health, or just relax your body and soul. Let's take a closer look at some of the national parks of the country. The ecotourism and agrotourism are new and quite promising directions of tourism. The fact that the ecotourism is gradually becoming popular in our country is natural, since there are all conditions for this, first of all, the unique geography and nature. This direction is very attractive for residents of the country, and for foreigners, and this involves making big investments in the tourism sector.